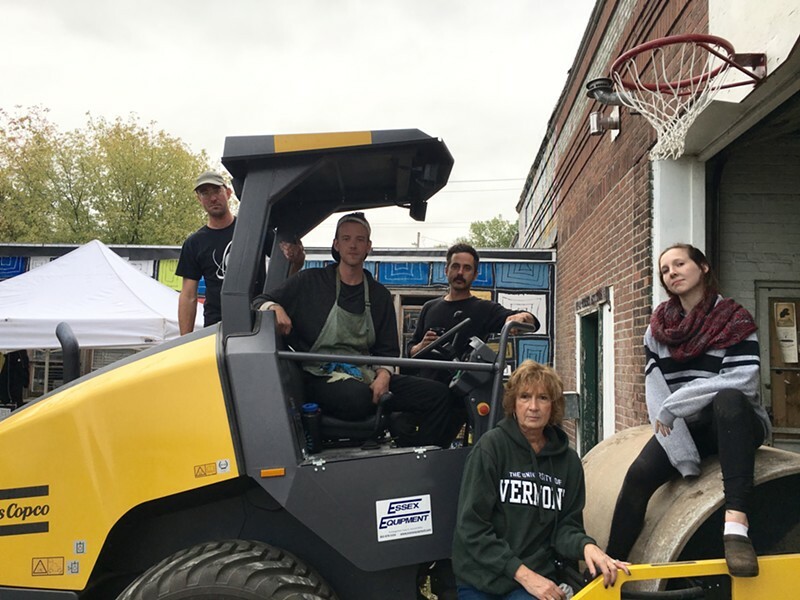 On a blustery gray Saturday, Noah Lagle grinned as he honked the horn atop an industrial steamroller at the entrance of Pine Street Studios in Burlington's South End. He then drove the massive machine into the open garage, over a carved woodblock covered with paper, which was nestled under a felt blanket under yet another piece of wood. It was an art sandwich, so to speak. 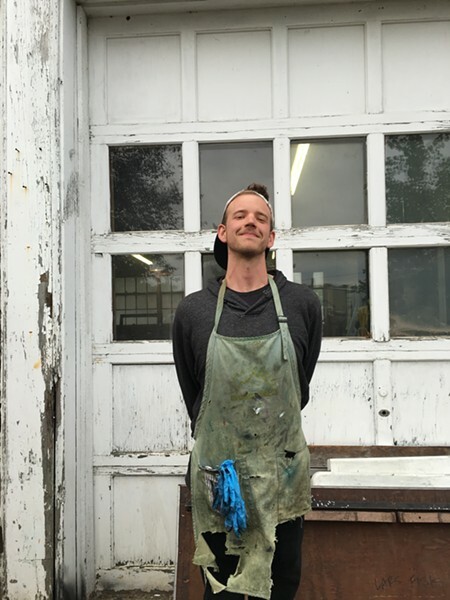 Lagle, 25, is the artist behind Public Works Press, a small printing operation now in its second year of distributing an art CSA (Community Supported Arts & Culture). He is also one of the 16 local artists who received a grant from the Burlington City Arts Community Fund, a new program that supports local artists engaging the community with special projects. Such as this steamroller printing event. Lagle hosted two carving workshops per week throughout September, kicking off the series during the South End Art Hop. 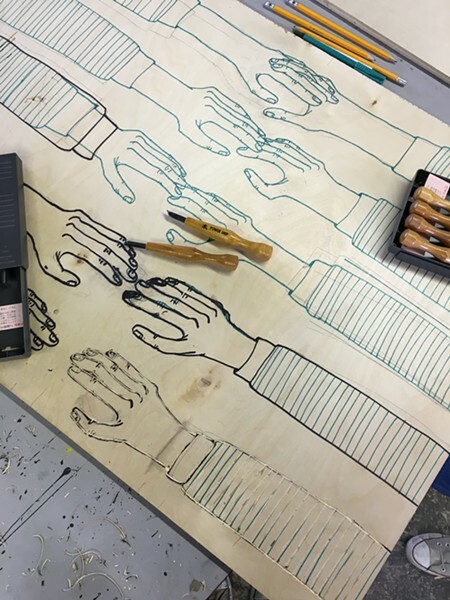 For $20, anyone could come to the studio, get a large piece of wood and receive basic tutelage in carving their very own block for printing. He provided traditional cutting tools, as well as a dremel and router for those with less patience and time (or, like this reporter, with a fondness for power tools). This weekend, everyone got together for a two-day printing party. Participants ranged in age and occupation, although the latter skewed toward arts professional. Some of the area artists present were Matt Penney, Sarah Letteney, Lydia Kern, Katie Loesel, Clark Derbes and Wylie Sofia Garcia. Even Mayor Miro Weinberger turned out with his two kids, both of whom made small prints. Artist and activist Jen Berger, who sat on the BCA panel that selected Lagle for the community fund grant, was there, too. 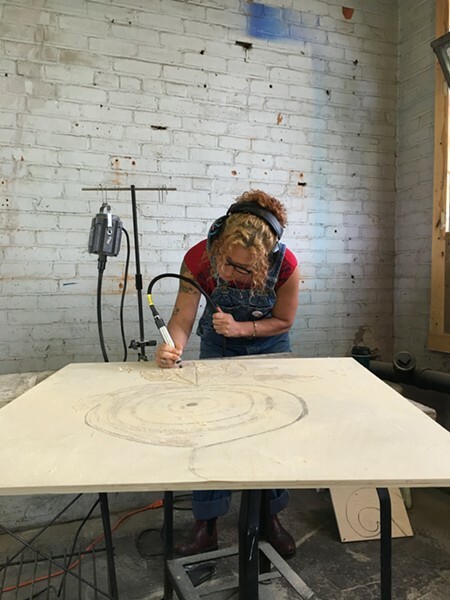 On Saturday, she took a break from carving a large beet with a dremel to chat with Seven Days. "For me, having studied community-based arts for the last 12 years, [this project] hit all the important components," Berger said when asked why she advocated for Lagle's project. "It's accessible, it brings people together, people can interact with it in their own artistic way, and the process is really bold and out of the box." Berger pointed out a younger participant, who she surmised was about age 6, carving under one of the tents outside the studio. "It's important for people of any skill level to find their way of being in it, to explore and experiment," she said. Facilitating in that exploration and experimentation were artist Mary Aveno and her mother, Mo Aveno, who drove up from Rhode Island for the weekend. Aveno met Lagle at the University of Vermont when he was a teacher's assistant and she was a student. She also introduced him to the annual steamroller printing event at Helen Day Art Center, where Aveno interned — that's what gave him the idea for this event. 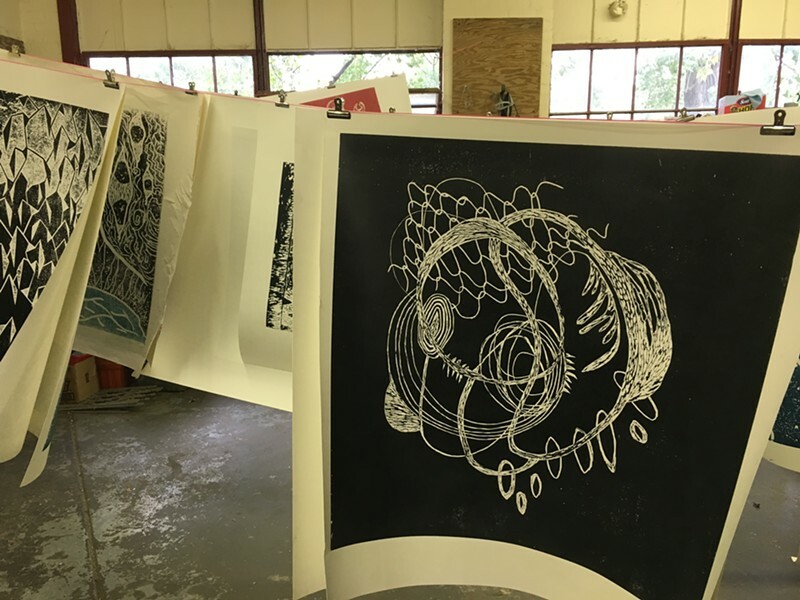 While Lagle handled the steamroller, the mother-daughter team greeted participants and showed them how to prep their prints for rolling with the thick, gloppy ink. After printing roughly 150 large sheets with designs by 50 people over two days, Lagle closed up shop on Sunday. Reflecting on the weekend, he said, "When I was writing the grant, it was a lot of trying to imagine what would happen today, and now I've seen it come true." He also noted that, in true community style, quite a few people helped him pull the shindig together. Grahame Mackugler, Derek Proulx, Jamie Barratt and Derbes all took turns driving the steamroller so Lagle could help out on the ground. "It was a dream," he said. "I had a kind of if I build it, they will come, moment. And they came." He may be beat from this weekend, but Lagle's efforts are far from over. 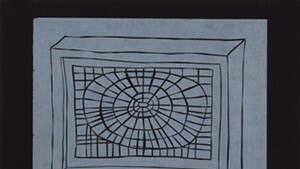 On Friday, October 7, there will be an affordable silent auction of the large-scale prints at the Karma Bird House Gallery. Proceeds of the event will support arts programming at King Street Center.